Looking to make your own beef jerky but don’t know how? Well the quickest and easiest way to make beef jerky is by using a specially made jerky dehydrator. Whilst the process of making jerky might sound complex and confusing, using a dehydrator is far from difficult and you will be making kilos of quality jerky in no time. Food can be prepared, served, and even stored in many ways. At the same time, snacks can get boring, and many food items can be difficult to store over time or keep without refrigeration. This is why so many individuals are constantly looking for new exciting ways to spice up their dietary habits. Why stick to the same old stuff when you could try something new? Preparing food with a dehydrator is a great method of creating new tasty treats for snacking on the go! It is also a perfect method to make meal and snack preparation incredibly simple. A quality food dehydrator is the ideal snack-making appliance for individuals who are busy but still want to prioritize their health and dietary habits. Busy parents say that these devices are great for prepping their children’s school lunches or after-school snacks! Here on our site, you can find the best jerky dehydrators. With this appliance, you’ll be snacking on delicious treats in no time, saving yourself both time and money! What Can You Do With a Dehydrator? Many people who cook frequently become frustrated when their fresh foods expire or go bad on their shelf. Sometimes, this can’t be helped. People may be too busy with work, school, or a family to prepare these foods before they go bad. Luckily, there is a solution. Dehydrating your food to make tasty snacks allows you to extend the length that your snack foods remain edible for much longer. This ends up saving those who use food dehydrators both time and money. It prevents the need for excess trips to the grocery store to replace expired items. Dehydrating food in general also does not diminish the nutritional qualities that the food item possesses. This is great news for those trying to stay on a healthy meal plan despite their busy lives. All the nutrients and vitamins in regular foods remain even once the food is dehydrated. 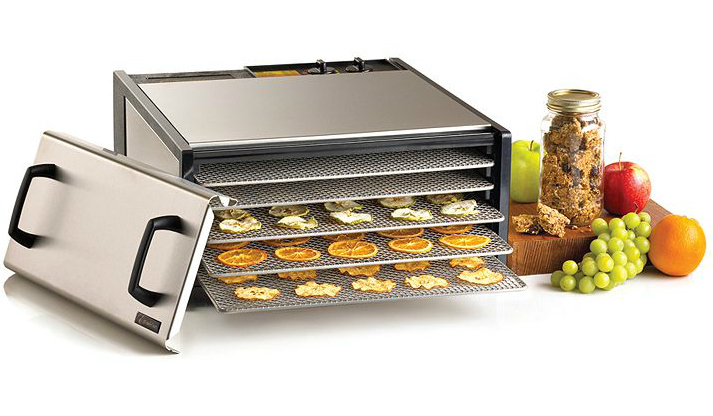 Much like an oven or microwave, a dehydrator functions through the use of heat and fans. The result, though, is quite different from any other kitchen or food preparation device. Dehydrators essentially remove the water found in the food item or items placed within. It is able to do this with a fan that blows hot air onto the item over a period of time. Because the food items are now devoid of that intense water content, they are less prone to bacteria, mold, or other hazardous developments that occur as food ages. This is why they tend to last longer in the pantry than they would if they remained full of water. It is able to keep its vitamins and nutrients because all it is really losing is the excess water. There are several components that make up each device, but the ones of primary importance are the fan, the capacity of the dehydrator, and the temperature. These features all intertwine to create the best dehydrated foods. One thing to make note of is the type of food that you would like to dehydrate the most. This can be fruit, vegetables, meats, or otherwise. What’s important is to make sure the unit you buy can cater to that type of food with the right temperature settings. Experts and chefs recommend the back-mounted fan as opposed to the top or bottom mounted fans. Back-mounted fans offer more thorough and consistent dehydration. However, it ultimately depends on the type and quantity of food you are intending on utilizing with this unit. If you are hoping to prepare small snacks and meals for your home, a smaller unit would be best. If you are an event planner or caterer who needs to generate larger quantities of meals at a time, opt for larger square footage of tray space. That way, you can save yourself time having to watch over multiple batches. Because of how it varies from item to item, getting the dehydrating process just right can be difficult. Every piece of fruit and every vegetable has a different amount of water within it as well as a different overall composition. This means that it can be hard to know just when to stop dehydrating the item. Any food dehydrator will be easy to figure out and get the hang of, but we hope to save you a few bad batches with these simple tips and tricks to help you make the most of your dehydrator! • Time and Temperature Are Vital! Every device is different, just like every food item is different. Just because you’ve used one before doesn’t mean that the next dehydrator will work the same. Make sure to check the instructions regarding temperature to ensure that you dehydrate the food for the proper amount of time! About 95% dehydration is the perfect amount to make some delicious, crunchy snacks that keep well in the pantry for long periods of time! • Where Are You Using Your Dehydrator? Something that many first-time users overlook is the temperature of the space in which the appliance is being used. If the room is incredibly cold or even damp or humid, it can be damaging to the process of dehydrating the food. It can make the process occur slower, or not at all, and it can alter the temperature needed to produce the desired effect on the food items. The best place to utilize your appliance is in a dry place with a solid, warm temperature that does not fluctuate frequently. This will produce the most delicious snacks at the right consistency. Just like any other cooking process, patience is required to achieve the proper result. While this process is simple and often easier than many other methods of cooking or baking, it still requires a little bit of good old-fashioned patience. Attempting to speed up or expedite the process of dehydrating by increasing the temperature or turning the fan up can end up ruining the snack altogether. This is especially the case when utilizing a jerky dehydrator. It is important that your meat is not under or over dehydrated. To achieve the right balance, the appliance must work for the proper time at the right temperature, even if it takes a little bit longer than desired. It can be easy when shopping to fall into a trap of just buying the cheapest or the largest appliance you see. However, this is not the best approach. Instead, it is important to know the ins and outs of what each type of food dehydrator is best used for. If you intend on primarily dehydrating beef jerky, for example, one that tailors its temperature settings toward fruits and more watery snacks might not be the right choice. When you are able to select a high-quality beef jerky dehydrator, it means that you won’t need to replace it a few years down the line when other cheaper models would have fallen apart or required repair. It ends up saving you time and money in the long run. You can view some of the best jerky dehydrators on the market right here on our site. Make sure to check the features of each one to see which would be the best fit for you and your dehydrated treats!